The easy accessibility of the Bible in most of the world's major languages can obscure a dramatic and sometimes unexpected story. 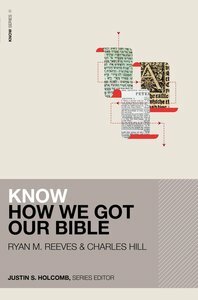 In Know How We Got Our Bible, scholars Ryan Reeves and Charles Hill trace the history of the Bible from its beginnings to the present day, highlighting key figures and demonstrating overall the reliability of Scripture. Reeves and Hill begin with the writing of the Bible's books (including authorship and dating), move into the formation of the Old and New Testaments (including early transmission and the development of the canon), and conclude with several chapters on Bible translation from the Latin Vulgate to the ongoing work of translation around the world today. Written simply and focused on the overarching story of how the Bible came to us today, Know How We Got Our Bible is an excellent introduction for formal students and lay learners alike. Each chapter includes reflection questions and recommended readings for further learning. About "Know How We Got Our Bible"